Well hello stranger! I mean, I’m the stranger. It’s been MONTHS since I’ve blogged. I know, you’ve heard this all before, but yes, I have been really busy. I have also been contemplating the great many changes in my life these last few months. I’ll start with the simpler things. Work has been very chaotic hectic recently, and that brings a whole new level of stress during the day. Which also leads me to being exhausted at the end of the day and every week. I’ve also been busy doing more vacuuming/chores since my dad has moved out. Which leads me into the more complex reasons I’ve been silent. My parents Divorce. With a capital D. Although I knew it was coming (and should have come much earlier), it still took me a little by surprise on how and how much it affected me. Things are just very different now in ways I didn’t expect. I didn’t really mourn, but still felt it deep inside. I wasn’t happy. I didn’t really want to go anywhere or do much (crummy, rainy weather didn’t help my mood any). I didn’t know what to say on here, so I didn’t. Sometimes words aren’t enough, and you need to just feel. I guess I felt I needed to reassess familial relationships (still trying to figure out this new territory) and how I want to relate to my parents separately and together. I know that divorce is tough on kids, but being an adult doesn’t mean that you magically have all the answers either. Why isn’t there a manual on this kind of thing? I finally feel that I am working my way up through the layers, back towards an understanding of myself and a happier me. I’ve been struggling health wise too. I had a raging ear infection and had to be on antibiotics for almost a month. It all started with a cold/flu/bug and made it way to my ears. After a few days of feeling miserable, not being able to sleep, and excruciating pain as I traveled up and down the hill to Chico with its big changes in altitude, I finally decided to go to the Immediate Care Clinic in Chico. After waiting forever in the waiting room (and sitting on the floor for part of that time due the overabundance of sick/hurt people and lack of enough chairs) I finally saw the doctor. He didn’t really believe me when I told him I thought I had an ear infection and described my symptoms. After looking in the ear, he exclaimed “My goodness, you do have a infection going on there.” I then proceeded to tell him, while trying not to be too smug (I still needed to get antibiotics from him after all), that I got them very frequently as a child and still get them occasionally as an adult. After a little negotiation about giving me drugs, (which I won! You didn’t bet on him did you? ), he tried to downplay it a little bit. Excuse me. You have years and thousands of dollars wrapped up in a good education, but you just met me a few minutes ago, and that doesn’t mean that I don’t know my OWN body which I’ve lived in my whole life. After all, I’ve had dozens of ear infections in my life. I remember a distinct fondness for the Pepto-Bismol-pink (but MUCH tastier) antibiotic that I got regularly as a child. I let him off the hook because he was young and cute with a nice smile. Just kidding (well, partially). He did, albeit very reluctantly, prescribe some antibiotics after giving me the spiel that they don’t really do much for ear infections, blah, blah, blah. I don’t run to the doctor every time I sneeze or have a cold for some antibiotics. Just give me my drugs already. Anyway, being on antibiotics negates the birth control that I take for my PCOS, so being off the pill also wrecked havoc with my system. After extended research and talks with friends, I have begun to suspect that I have some Insulin Resistance, a happy hitchhiker from PCOS. I went to my OB/GYN, and explained my symptoms, and that I wanted to have some blood work done. He too hemmed and hawed (what is up with this trend anyway? I know MY body for goodness sake! ), and while he didn’t refuse to order me tests, and even suggested some to include, I still got the feeling that he did it to placate me and didn’t take me seriously. I stayed off the birth control after I finished my round of antibiotics until I could meet with the OB/GYN and get my blood done. Just to make sure that I gave the tests the best, most natural results. Unfortunately, being off the pill for almost two months played havoc with my appetite and system. And in the end didn’t do me much good anyway. The blood work came back normal. In December, I took Missy down to the new Petsmart to have a bath and groom. One of the reasons why I chose this, is because a) It’s winter and too COLD to bathe her outside. And Mom doesn’t like dog hair all over the tub. And b) They are open on Sundays. So I can take her without having to ask Mom to do it or take off work. Groom went mostly fine, they did leave some dried poop on her behind (it gets stuck because of her fluffy “skirts”), but that was the least of it. She also developed a rip-roaring eye infection. A vet visit and $75 poorer Christy, didn’t make for a happy Petsmart customer. 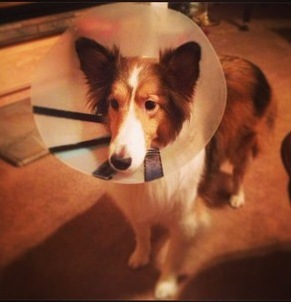 Poor girl, had to wear a cone and everything. In Petsmart’s defense, both the store and salon manager were super nice and are giving me a free groom. Her eye is fine now, but I’ve been so busy lately with my grandma’s house that I haven’t been able to take her in to cash in on it. Which leads me to the crazy busyness of traveling down several hours several times a month to try to take care of things there. What a long drive (and boring! Just highway to look at.) and a lot of work. I’m not really complaining about having to do it, but just wish there were a magic wand to wave to make it easier. So, you’ve heard the sob stories. I’m sorry! I’ll be willing to give you a full refund. Well, actually this blog is free, so a refund of 0 is still 0. Sorry. To end on a good note. Bogey is still snarky as ever and the Neon Tetra’s are doing fine with Blue Danube (the Betta fish) along with the cute oto’s (algae eaters). It’s nice having a new blog to read! I’m totally with you on the crazy life and how difficult it is…wish I could reply in depth to your excellent thoughts on divorce, IR, PCOS, and all that jazz. Oh well, you know I’m with you there in spirit! Glad we can talk about this stuff, and that you got a chance to blog it. Love ya! Wish I could be there to help with some of that craziness. I’m praying for you though. Love you!